It seems like more and more manufacturers are offering up longer warranties for their tools, and this is a move that I welcome. Duo-Fast is the latest to improve upon their warranty by giving their NEW 200-S and 200-C flooring staplers and nailers a 10-year warranty on all durable parts, and a 1-year warranty on parts that wear. Check the press release below for more details on the new warranties and the tools themselves. VERNON HILLS, IL (April 2011) – Duo-Fast® Floor Fastening Systems (www.duo-fast.com), a leader in professional carpet and flooring installation tools for more than 40 years, is increasing the warranty on its two hardwood floor installation tools. The FLOORMASTER™ 200-S hardwood flooring stapler and the FLOORMASTER™ 200-C hardwood flooring cleat nailer, which are designed to install solid 3/4" and 1/2" hardwood flooring, now come with a 10-year warranty on all durable parts and a one-year warranty on all wear parts. "These tools have undergone extensive testing including years of strenuous use in the field with professional installers, with no appreciable downtime," said Rita Bockrath, Marketing Manager for Duo-Fast Floor Fastening Systems. "We feel very confident in offering this warranty as a demonstration as to how well they are built and how long these tools will last." The new warranty on the FLOORMASTER™ 200-S and 200-C is in effect on all tools arriving in stores beginning April 1, 2011. The tools with the new warranty will be easy to identify as Duo-Fast has redesigned the packaging on both tools to call out the new warranty and the tool's key features. In addition, the carrying cases for both tools have been redesigned to hold two value-added items: the exclusive Duo-Fast® SoftShoe™ Pre-Finished Wood Flooring Adapter for higher quality work, and an O Ring Kit, making it easy for installers to service their tool in the field and reduce downtime. The SoftShoe™ Pre-Finished Wood Flooring Adapter offers a very functional design that provides stability and sets the tool precisely on the tongue of the floor board, allowing for positive placement of the staple or nail every time. Made from a unique blend of specially formulated polymers, the SoftShoe™ ensures a smooth finish that virtually eliminates accidental scratching or marring of prefinished hardwood flooring during installation. The FLOORMASTER™ 200-S hardwood flooring stapler and 200-C cleat nailer are powerful tools that can handle exotic hardwoods with ease. They feature a reload indicator that eliminates blank firing and damage to the tongue. Their ergonomic grip is designed for comfort and improved productivity. Both tools have a detachable handle for installers who prefer a shorter handle and the short handle has finger grip marks for added comfort. Both come in a rugged carrying case with an adaptor for 1/2" flooring, as well as the SoftShoe™ Pre-Finished Wood Flooring Adapter and an O Ring Kit. The 200-S stapler weighs 11.8 lbs, has a cycle rate of two shots per second and a staple capacity of 98. 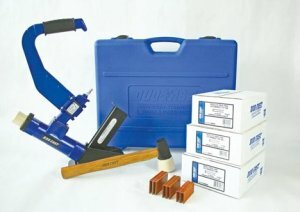 It is designed for use with Duo-Fast® DF Series 15 gauge staples of 1-1/2", 1-3/4" and 2". DF Series staples come in high grade steel that will not buckle, are galvanized for corrosion resistance and have a glue resin that bonds with wood fibers for excellent holding power. The 200-C weighs 10.4 lbs, has a cycle rate of two shots per second and a cleat capacity of 102. It is designed for use with Duo-Fast® LCN Series 16 gauge "L" cleat nails of 1-1/2", 1-3/4" and 2". LCN Series cleat nails come in high grade steel that will not buckle, and feature a tape collation that reduces breakage and eliminates waste. The cleat nails also feature sharp barbs that drive easily and provide excellent holding power. For more information, go to www.duo-fast.com or call, toll free, 1-888-DUOFAST. Duo-Fast Floor Fastening Systems is a subsidiary of Illinois Tool Works (ITW) and is the proud owner and manufacturer of the Duo-Fast® Brand of floor fastening products. As the leader in flooring installation systems, Duo-Fast Floor Fastening Systems focuses on providing innovative tool and fastening solutions for customers in the flooring market. ITW's emphasis on innovation creates value-added solutions to meet specific customer needs.